The prevalence of compassion fatigue, secondary trauma and burnout has been studied in emergency physicians, but there is little research on how different clinical events impact on doctors psychologically, physically and emotionally. In this qualitative research study of 17 emergency physicians we begin to understand how clinical events in emergency medicine have potential to impact on doctors’ well-being in terms of individual psychological and physical effects, and effects on relationships. This study highlights the need for intervention after clinical events in the ED and further research into how best to support a physician during these times. Emergency physicians (EP) work in a fast-paced and high-pressured environment, with constantly changing teams. The EP must be prepared to manage and process whatever occurs on a shift. This includes the potential of exposure to death, serious illness, trauma and suffering, often with no clear solution to the problems they face.1 This environment can lead to emotional disruption in the physician, which may be short or long term in effect. Previous research shows that EPs are at high risk of compassion fatigue, secondary trauma and burnout, and this may change behaviour in the workplace or at home.2 3 Despite growing literature reporting the potential stresses on EPs, there are no known qualitative studies exploring the meaning of emotionally disruptive events to EPs. There has been little discussion of the nature and effect of these events as reported by the physicians themselves. Qualitative research can provide a rich and deep insight into the psychological and physical disruption caused by events in the ED and could allow us to create meaningful steps to developing targeted interventions to protect the well-being of EPs. The aim of this study was to explore the impact of clinical events on the well-being of EPs, and to identify which events result in emotional disruption. It used tacit knowledge gained by working in the setting in which the research was carried out. A qualitative method was adopted. Inductive data analysis was applied. The results reflected a case study reporting mode. The implications were considered tentative, especially with respect to transferability. Participants were recruited from Central Manchester University Hospitals NHS Foundation Trust ED. Written information sheet and given an opportunity to ‘opt in’ to the study were distributed around the department, during key times such as morning handover, junior doctor teaching and consultant meetings over a week’s period in September 2016. There were 69 potential participants comprising 26 consultants, 8 non-training registrars, 11 non-training senior house officers, 5 training registrars, 15 foundation doctors and 4 general practitioner trainees. Participants were made aware that: selection from those ‘opting in’ may occur to ensure representation of doctors at all levels of training, and that selection would continue until data saturation.7 8 Written consent was obtained from all participants prior to the interviews and it was confirmed with all participants that they could withdraw at any time. All participants were informed that our staff support team were available for anyone experiencing distress following the interview. Narrative style interviews were conducted with EPs using the prompt: ‘Could you tell me about a time when an event at work has continued to play on your mind after the shift in which it occurred was over?’ Follow-up questions were then based on the information provided by the interviewee. All participants were interviewed by a single investigator (LH) who was also an EP, working within the organisation. Interviews were audio recorded and transcribed verbatim for analysis. Pseudonyms were used in all transcripts and are used throughout this report. Interview recordings and transcripts were stored on an encrypted, password-protected hard drive. Data analysis was carried out using a process similar to that of framework analysis, allowing the inclusion of both a priori and emergent themes.9 This process involved data being read and re-read and emerging themes noted alongside a priori themes using a constant comparative approach. Phases of familiarisation and indexing led to the development of a thematic framework, discussed and agreed between the authors. This framework was used for data extraction, mapping and interpretation. A priori themes arising from the aims were ‘the clinical events that resulted in emotional disruption’; ‘the psychological and physical effect of these events’; and ‘work events intruding on personal relationships’. Emergent themes (not reported here) were ‘positive experiences within the ED’; ‘cultural influences on experiences’; and ‘professional help and support’. This paper focuses on the a priori themes (see figure 1): a second paper will focus on emergent themes. A priori themes and subthemes. Of the 17 physicians recruited to the study, there were 10 men and seven women, with various levels of experience (table 1). We identified several factors relating to clinical events that seemed to cause emotional disruption, often for many years after the event. Participants could recall the clinical encounters in vivid detail and clearly reported the compounding factors that they believed made these events memorable. Several participants reported being affected by witnessing patients dying at either a young age or a perceived young age, or in a traumatic manner. The detail of these memories remained vivid to participants. Some of these included doctors recalling events where highly invasive procedures had been carried out on young babies and children and the child had still died. Other confronting events included a young woman who had been sexually assaulted and left to die, where entire families had died leaving only one surviving member and having to tell a pregnant mother and young child that their husband/father had died. I just saw a guy with heart failure, he was a young guy and he was waiting for a heart transplant… I went to see him the next day and he had died. He had just arrested in the night…it’s just so sad that someone would die so young, so quickly and so tragically. Things can be very upsetting. Particularly I remember, a couple of times, you know having a child in… who was the same age as my child… who had been killed in a road traffic accident. I found that really hard because he was a similar size and age and… if you didn’t look at his face you would assume it was the same. I shouldn’t have sent that patient home or I should have got them to come and see them coz I think regardless of whether you have written down on a bit of paper and discussed with so and so, it is still your patient and you have to take responsibility. A range of both psychological and physical effects, along with sleep disruption, were experienced by those reporting emotionally disruptive events within the ED. Participants reported that work events regularly had a negative impact on their personal relationships. These relationships also seemed to affect the way they processed the event that had occurred. None of the people in my life outside of work have any kind of frame of reference for any of this. This is all really weird and they don’t really know what to say and it’s making everybody else feel very uncomfortable so I kind of need to package this up and deal with it in a way that I can deal with it, rather than expecting other people to be able to. There is increasing evidence of the risk of potential harm to EPs in relation to their work. Burnout and trainee retention are recognised problems within EM, which may be a result of emotional disruption.10 However, to our knowledge this work is the first to use qualitative methods to allow an in-depth exploration of the impact of events on the well-being of EPs. Our findings demonstrate that events occurring at work have a profound impact on EPs. This may occur as a reaction to routine events, rather than being restricted to those that are particularly traumatic or related to medical error. 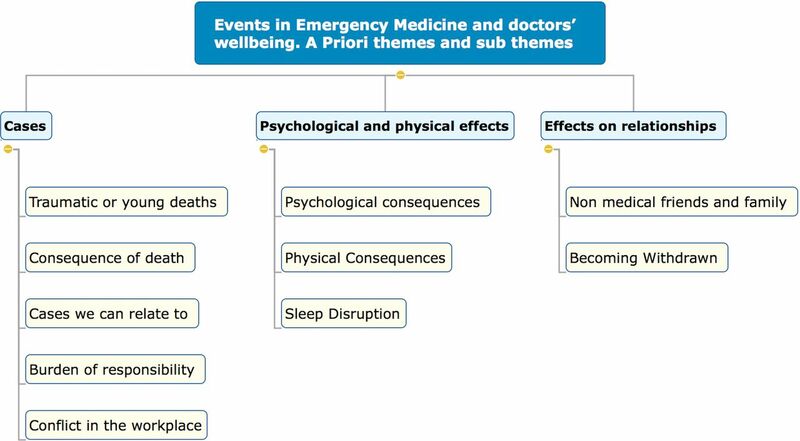 A wide range of events triggered distress in EPs, which fitted into the broad themes presented. How EPs will respond to events is difficult to predict, as they are deeply personal to them and their circumstances. Cases at work affect EPs both emotionally and physically and extend to disruption of personal relationships. Our participants often reported experiencing difficulty with sleeping due to intrusive thoughts about events at work. These effects can last for long periods of time, for some several years. These events often affected physicians’ relationships with their family and friends. Several participants reported becoming more withdrawn, feeling unable to talk to friends and relatives (particularly if they were from non-medical backgrounds) and reported that this could cause conflict and frustration at home. Reported negative effects, following cases that continued to intrude on the well-being of EPs, were not associated with the level of experience. Concerning and long-lasting impacts of these events were described equally among participants. The results exemplified that you cannot predict the impact of a particular case across a cohort of participants. What may be an ‘ordinary’ case with no physical or emotional impact for one EP may have a profound and particularly damaging outcome for another EP. The cases that one physician may identify with may not have the same resonance with another physician. Additionally, the burden of responsibility felt by one physician may not be carried by another. These results indicate the need for physicians to have a deep sense of self-awareness to their own reactions to cases and a strong investment in their own well-being. Leaders in EM ought to provide a multifaceted approach to EPs’ well-being, and be able to account for these individual responses and requirements, in order to facilitate recovery and resilience. All participants opted into this study after reading a participant information leaflet and were therefore a self-selected group who were eager to share their narrative, creating an inherently biased group. EPs who remained resilient irrespective of the clinical case or those who felt deeply shamed or impacted by a case may have opted not to participate. All the participants spoke of past events in the interviews, which may mean the study misses an important group of physicians who were being affected by events at the time of data collection. To maintain participant confidentiality, the age, gender and years of clinical experience of participants have not been disclosed in the results. While this was a single-centre study, the training doctors interviewed and consultants (who had all been through EM training) were often recounting events that occurred while working in EDs in different hospitals. In this study, 41% (7 of 17) of participants were consultants in EM, meaning they had many years of experience in this field. Due to this, they may have developed mechanisms for coping with events they are exposed to in EM. Conversely, sustained exposure to such events may have resulted in a greater negative impact on their well-being, when emotionally disruptive cases were encountered. This study demonstrates that events at work may affect a physician, and in some cases, have a negative impact on all aspects of their lives; emotionally, physically and on personal relationships. The research brings up many questions, mainly about how we can help physicians when these events do happen. Our findings lead us to ask whether we require a culture change in EM, so that physicians have a safe environment to reflect and share concerns with a goal to minimising long-term impact. They should also lead us to ask specific questions about matters that seemed to particularly affect EPs. For example, we should ask how we best provide support to EPs undergoing legal proceedings such as coroner’s cases, and how we can help physicians process the responsibility they carry. This research gives insight into how the cases physicians can encounter in the ED can affect a physician’s psychological and physical well-being. In some interviews, these effects are deeply moving showing the need for further research in EM well-being, especially researching tools to increase resilience.
. Naturalistic inquiry: Sage, 1985.
. The new language of qualitative method. Oxford: Oxford University Press, 1997.
. Using conceptual depth criteria: addressing the challenge of reaching saturation in qualitative research. Qualitative Research. doi: 10.1177/1468794116679873. [Epub ahead of print 14 Dec 2016].
. Qualitative data analysis for applied policy research. The qualitative researcher’s companion. 2002;573:305–29.
. Analysis: practices, principles and processes. Qualitative research practice: a guide for social science students and researchers, 2003:199–218.